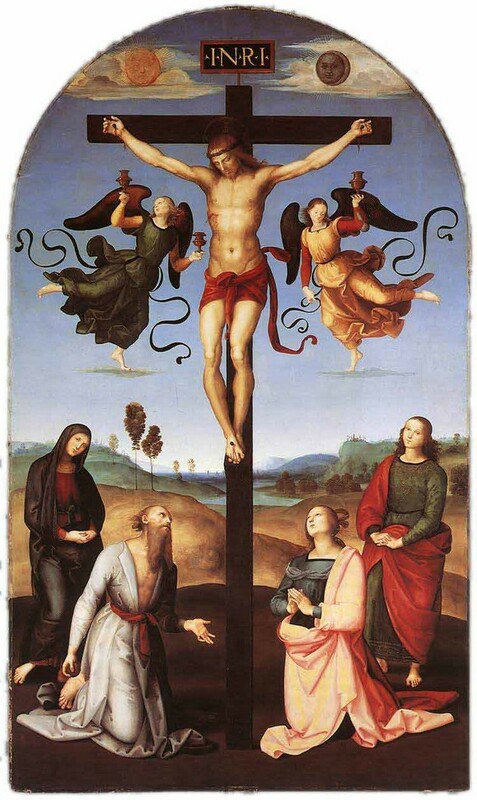 Raphael in 1503 returns to the theme of the Crucifixion, and this altarpiece, now preserved at the National Gallery in London, was placed on the altar, property of the family Gavari, present in San Domenico in Città di Castello. In the upper part, Christ on the cross, on his right and left, slightly lower, smaller in size, two angels collect the blood in small cups; still higher the moon and the sun, silently watching the tragedy. In the lower part, in the foreground, at the foot of the cross, a kneeling saint Jerome and Mary Magdalene, both with the head facing up, behind, in the background, the Virgin Mary and st. John the Apostle. Raphael set the figures on two planes, being able to organize the space through the arrangement in a semi-circle, this accentuates the sense of perspective in the composition; the four figures, therefore, are arranged around the cross. Behind it, in depth, opens with a hilly landscape, which is proportional and well-defined in dimensions, and thus well linked to the characters, Raphael, in addition, through the gradation of colors, it succeeds in making the sense of depth. In the figure of Christ, Raphael returns to the classic statuary, he makes it through the snow-white color and the light, the anatomical beauty of the body, without neglecting any detail. Raphael creates a bond in the characters of exteriority and interiority, the face of the saint traps the sense of pity. <<...in San Domenico one of a Crucifix, which, if there was no written name, no one would believe the work of Raphael, but it is of Peter..>>. (Written on the 29th of February 2016 by AntArtIco).